Twenty years ago, at the height of his battle for control over his musical career, Prince posted an unusually candid and direct letter to his fans, including an explanation of his name change. The letter, entitled “Message from The Artist”, marked one of the few times that Prince (then known as O(+>) would drop his guard and state his intentions plainly and without his characteristically oblique phrasing. It explained everything from his rationale behind changing his name to his feelings about the way the record industry operated at the time. It starts by quoting Prince’s December 22, 1995 press release declaring his desire to terminate his contract with Warner Bros Records, but goes far further into Prince’s motivations. 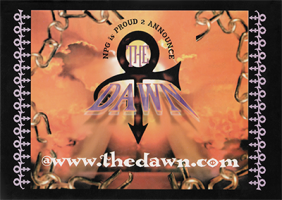 Originally posted when Prince’s first website thedawn.com opened in February of 1996, the message was shared in a hidden document not linked anywhere on the site. Fans found the letter within hours of its posting, and it was removed within days. Weeks later, a less personal version, rewritten to be from a royal “we” rather than Prince himself, was briefly shared on the site, then that revised letter was removed as well. Like nearly all of his websites, thedawn.com was left to languish after Prince moved on to his next album, and few archives of it exist today. Except for formatting changes (the original letter used a picture of Prince’s symbol rather than typing it out), this is the exact text of the letter, copied from an archive of the original page. U have just accessed the O(+> experience. “ O(+>has officially given notice to Warner Bros. Records (WBR) of his desire to terminate his recording agreement with the company. Over the course of their nearly two decade long relationship, The Artist and WBR have developed irreconcilable differences. Most recently, the unstable and ever changing management structure within WBR has made it impossible for the company to effectively market and promote its flagship artists, including O(+>. The Artist is prepared to deliver the three (3) remaining albums under his former name Prince which will fulfill his contractual to WBR. Currently, the albums are titled: Prince: The Vault — Volumes I, II and III. The press release wasn’t very detailed, but it outlined my feelings as the Holiday week approached. While it was a message to everyone, it was more for the ears of the entertainment industry, and specifically it was geared towards the music industry and its musicians — both young and old, green and seasoned, struggling and successful. These words from Paisley Park are from me. My ultimate message is a cry for solidarity amongst artists and a reprieve from the greed of entertainment executives. My message stems from a lifetime of development as an artist and as a businessman, and my increasing awareness of a greedy structure within the music industry that unjustly rewards large, slow corporate management teams, while overlooking and not protecting its bread and butter — the artists. As difficult as it is to admit now, when I began my career with Warner in 1978, I had a lot to learn. The transition into the artist I am now hasn’t been a smooth one. I don’t want other young artists to be mislead in the same way. I’m expressing my feelings so that others will learn from my mistakes. I also want all established artists to understand the issues and know that there should be a better way and to join with me to create that new path. At 37 years old, I have been a recording artist for Warner Music for what will be seventeen years this April. I was only 19 years old when I recorded my first album as Prince. Recording for a large label was new and exciting. I had an opportunity to reach millions of people around the world, not just my faithful following here in Minneapolis around the club scene. As time passed, the realities of the music industry and its current hierarchical pecking system sunk in. Artists are last on the totem pole in terms of recoupment. My path has been a long and arduous one. In the beginning, both youth and excitement towards the opportunity to have an album produced made me, as Prince, naïve. Saavy lawyers claiming to have my interest at heart, long in bed with the record companies they pimp, offered me what seemed to be a lucrative contract, without fully explaining the ramifications of its terms. I wrote an album a year for many years until I realized a trap had been laid. I would never be able to leave the legacy of my music to my family, my future children or anyone, because “Prince” did not own the Masters—I did not, and still do not, own my Art. For most of all of my adult life, I have labored under one construct. I compose music, write lyrics, and produce songs for myself and others. My creativity is my life; it is what guides my everyday, my sleepless nights. My songs are my children. I feel them. I watch them grow and I nurture them to maturity. I deliver them to my record company, and suddenly, they are no longer mine. The process is painful. I have been long ready for a new program. The time is now. As an artist, I want to share my music with others. I crave the experience of writing and sharing with others. It is what I do as an artist; as a human being. I take pleasure in the fact that others are able to share in my joy once the process is complete. My fans are my children’s friends; I respect them and want to communicate with them. As a businessman and the owner of NPG Records—the label that released The Most Beautiful Girl In The World—the 1994 Number One release by an independent, I realize that record companies are a natural part of the food chain. It is the record label that allows a musical artist to reach out to his or her audience, but that does not mean that whichever organization markets and distributes the music should own the final product, i.e. the Masters. What I have learned as both an artist and a businessman is that a middle ground must be developed. All artists, whether new or established, must have a substantial ownership interest in the music they create. Conversely, all record labels need an incentive to market music and push it thorough their distribution systems; still, that incentive should not be ultimate control. Record labels have no right to enslave the creators. The first step I have taken towards the ultimate goal of emancipation from the chains that bind me to Warner Bros. was to change my name from Prince to O(+>. Prince is the name that my Mother gave me at birth. Warner Bros. took the name, trademarked it, and used it as the main marketing tool to promote all of the music that I wrote. The company owns the name Prince and all related music marketed under Prince. I became merely a pawn used to produce more money for Warner Bros.
By my 35th birthday, June 7, 1993, I was beyond frustrated with my lack of control over my career and music. It seemed reminiscent of much that had been experienced by other African-Americans over last couple of hundred years. They had turned me into a slave and I wanted no more of it. The dilemma had only one clear solution. I was born Prince and did not want to adopt another conventional name. The only acceptable replacement for my name, and my identity, was O(+>, a symbol with no pronunciation, that is a representation of me and what my music is about. This symbol is present in my work over the years; it is a concept that has evolved from my frustration; it is who I am. It is my name. I look forward to the release of Emancipation in the near future. It will be The Dawn of the next phase of my life as a musician. It will represent my freedom from the past and it will be a continuum of what I have started here today.